After 15 years of blood, gore and metal, Cannibal Corpse return with "The Wretched Spawn" and without showing any signs of slowing down, deliver a hefty dose of technical death metal, carnage and every disgusting object that their fans were drooling for. Crisp, clear production, brutally heavy and with enormous energy "The Wretched Spawn" is bound to slit throats, desecrate bodies and crush testicles. What else did you expect? With their most powerful sound yet, Cannibal Corpse exploits their songwriting talents and climbs the new heights of their technical abilities. Musically, "The Wretched Spawn" is the most diverse and multi-layered album in their discography. From finger breaking technical parts to the muscular pit inviting riffs, Cannibals rip through 13 tracks like a merciless killer slaughtering the masses. All songs are sick, filthy and soaked in the blood of their victims but not all of them are just full speed gore raids. Between speed demons like 'Psychotic Precision,' 'Frantic Disembowelment,' 'Cyanide Assassin' or 'Blunt Force Castration' there are few tracks that are taken a step down and serve as a perfect equilibrium to my bleeding ears and create the feeling of a well structured, thought-through release. Those tracks are not only taken a few steps down but they are so varied stylistically that I can't wait to see a pit going crazy to 'Decency Defied' or hear live version of Pantera's style title track, 'The Wretched Spawn,' before it kicks into a higher gear and takes on a more Cannibal Corpse shape. Did I mention doomy 'Festering In The Crypt'? Complex but not overdone and well-balanced "The Wretched Spawn" delivers Cannibal Corpse at its best. Death metal doesn't get much better than this. On the side of things that didn't change at all, are lyrics and style of the cover, but after 15 years of coming up with fresh ideas on killing people you have to appreciate the effort and enjoy 'Severed Head Stoning' or 'Rotted Body Landslide.' 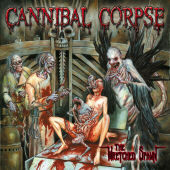 Cannibal Corpse is not about being original or setting trends, they have already done this. "The Wretched Spawn" is about a continuation and mastering of their own visceral style and that's where this album shines.